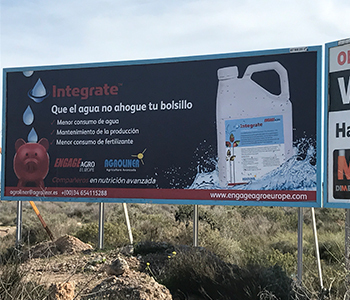 This is part of our continuing support of the our Spanish company Engage Agroliner and is part of a promotional campaign to increase awareness that Integrate will reduce water and fertiliser requirement in the Mediterranean by up to 50% without loss of yield or quality. The billboards are located in strategic points in the three main growing regions of Almeria – Almeria itself, El Ejido in the west and Nijar in the East. The local response has already been positive with many distributor being asked about this ground breaking technology.